You live in a quiet, peaceful castle surrounded by huge, strong stone walls. Every morning you wake up knowing you and your loved ones are safe. Then one morning as you rouse yourself from slumber you find the forest surrounding the castle teeming with orcs, goblins, and trolls. You must rise to the defense of your castle, no matter how overwhelming the odds. In Castle Panic, you must try and protect your towers from wave after wave of monsters. The only way to survive is to outlast them all! 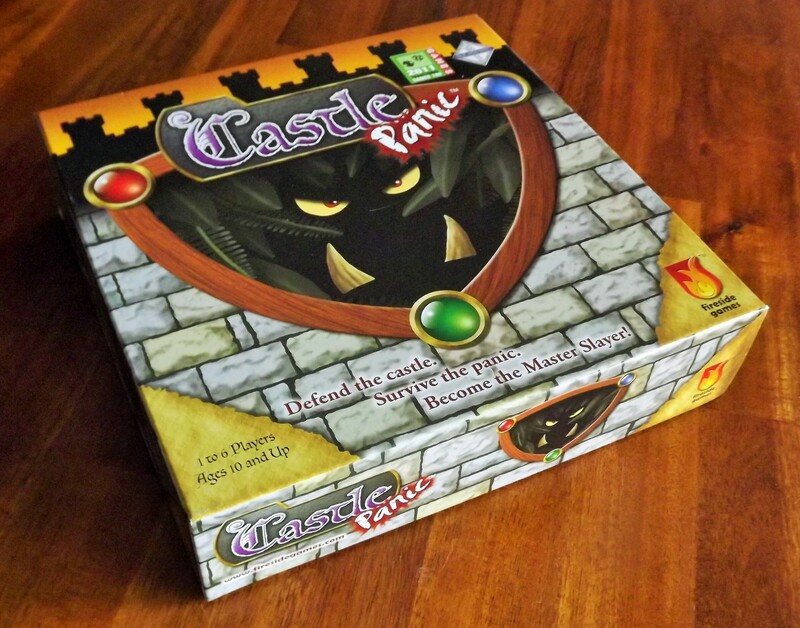 Castle Panic can be a semi-cooperative, co-operative, or competitive game played with 1-6 players. The players work together as a group to slay the monsters and save the castle, but only the player with the most victory points is deemed the Master Slayer! 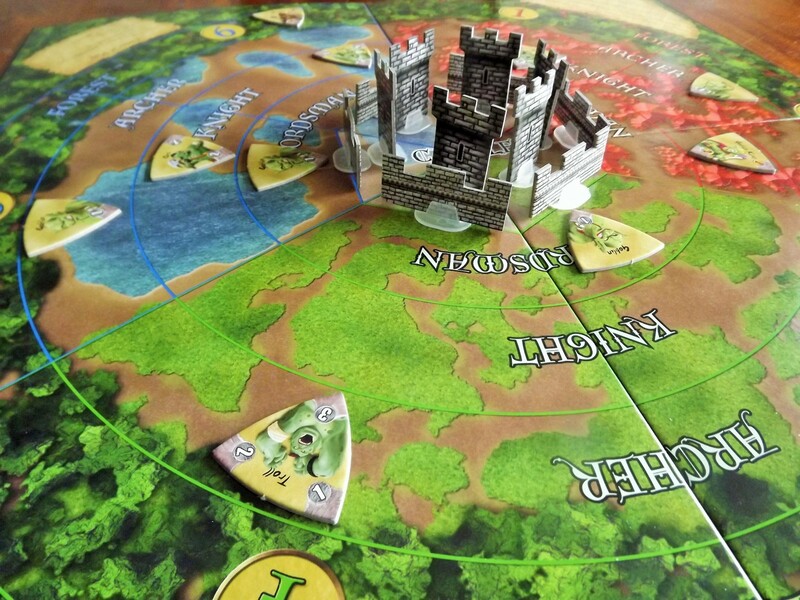 In the Overlord version of the game, one player takes on the role of the monsters and tries to keep the others from defending the castle. Draw up – You draw back up to a full hand of cards. Discard and draw one card – This step is optional if you wish to get a new card. Trade cards – You can trade a card with one other player. This step is also optional. Play cards – You play as many cards as you can to attack the monsters and help defend the castle. 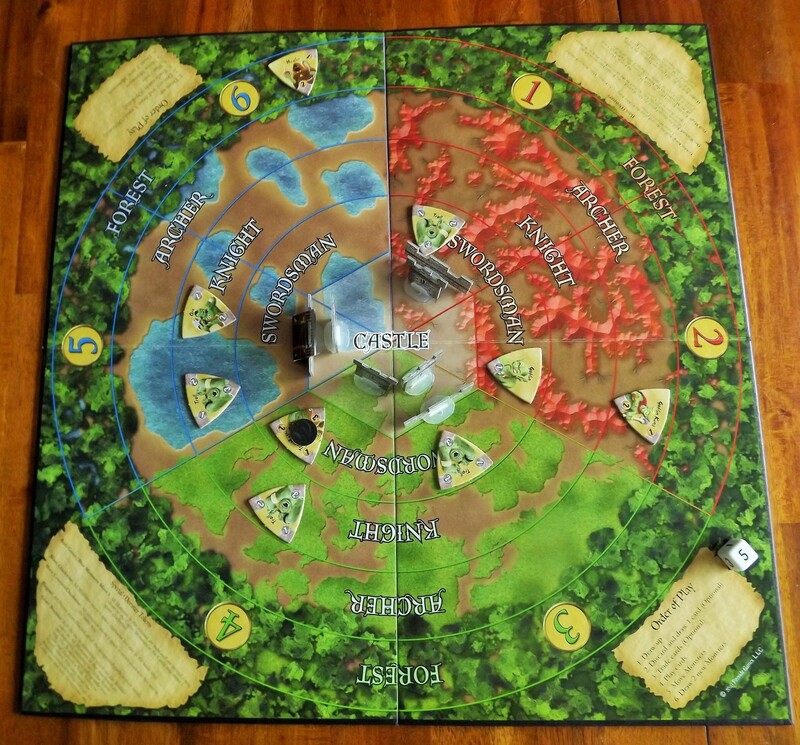 Move the monsters – Each of the monsters still in play moves one space closer to the castle. If they are in the castle ring, they move one space clockwise. Draw two new monsters – You draw two monster tokens from the monster pile and turn them face up one at a time. You roll a die to see what section the monster is placed in, and place it in the outermost ring of that section. During the play cards phase you can use any equipment you pick up to help you out as well as combating monsters. Bricks and mortar to build more walls, fortifications, tar to keep the monsters at bay, and a card to drive monsters back. The game ends when either the last tower is destroyed (monsters win), or after all 49 monster tokens are played, the monsters are defeated. In the semi-cooperative version,each player keeps the monsters they slay, adding up their victory points. The winner(most victory points) claims the title of Master Slayer. If playing the co-operative version, all players are declared winners (or losers, if the monsters overrun the castle). We can keep them out! In the Overlord version, the game is a little different. The players take their turn as usual, but don’t complete steps 5 or 6(see above). Instead, the Overlord moves the monsters and plays one of three monster tokens in their hand. This allows the Overlord to choose where the monster go. If they choose to use two tokens then a roll of the die determines monster placement. The game ends like the standard game with either the Overlord or the players victorious. Castle Panic lives up to its name. As the monsters close in to destroy your castle, your heart races. You do panic! There are times when you lose hope as it seems inevitable disaster awaits! However, with this game, you can never say it is over until the last tower has fallen. More than once we have been snatched from the claws of defeat, by a well-timed boulder or a lucky draw of the cards. Then again, sometimes fate just isn’t with you and the monsters end up overrunning your castle. I have had games where they have been over within 15 minutes of starting just due to bad monster draws! I like the replay value of this game. With the die rolls and randomized cards, no two play-throughs will be the same. Of course, this can lead to frustration as well. One of our games resulted in all the monsters being placed in one section due to the dice rolls. I swear the die was loaded at that point! We were overrun pretty quickly after that since none of the players had the right colour of cards to defeat any of them! They smashed through our walls and took the castle down in only a few turns! The three different ways to play (standard, semi-cooperative, or cooperative) allow you to use different strategies and you can alter some of the rules to increase or decrease the difficulty. These gives you the flexibility to tailor a game to the players around the table. Co-operative mode/easy game rules makes it fun for young children (game is recommend for 10 and up but I think younger kids could understand its rules and have fun with the theme). Or when playing with friends, you can ramp it up and have someone be the Overlord! It’s a great introductory game for new gamers as it’s easy to learn, fun, and quick to play. The co-operative aspect helps a new gamer who may become overwhelmed since everyone is in it together! The game can be played solo or with two or more players, but plays better with more people. The Overlord version does not work well with less than three players. A single player fighting the Overlord’s monsters never has enough cards to keep them at bay so there is a strategic advantage in having more people play. Also by being the Overlord in a two player game, there are many ways you can mess up the other player. You can overrun them pretty quickly. I felt the theme of this game was weak. 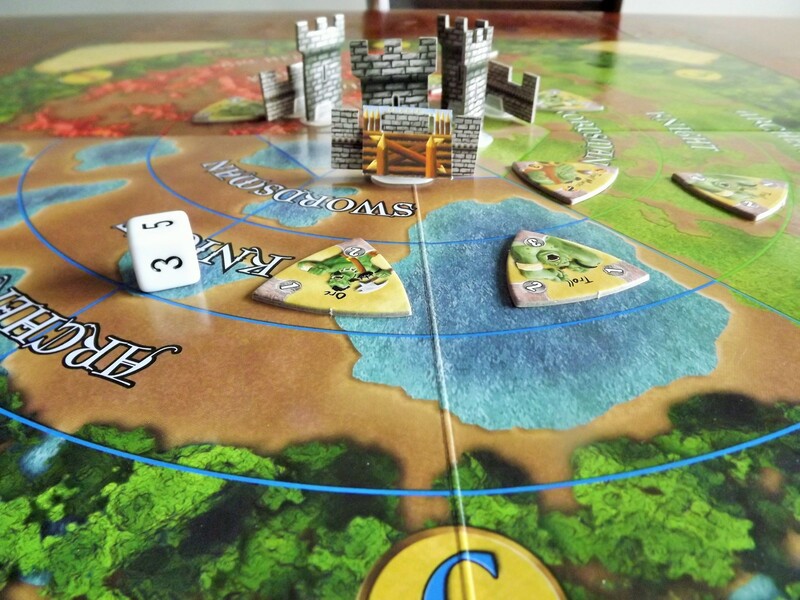 There are monsters and a castle, but I never felt like they were more than just tokens on a board. I would have liked to have had the theme come through more. When I play games like this where the mechanics aren’t overly complex and the turns get repetitive, I like to feel as though I am swept away by a story or at least have the ability create one. With this game I have not been able to feel that way. It is fun, and there are moments of sheer panic when the walls start coming down around you, but other than the fact that the game might be lost, I really can’t picture myself as an active character. 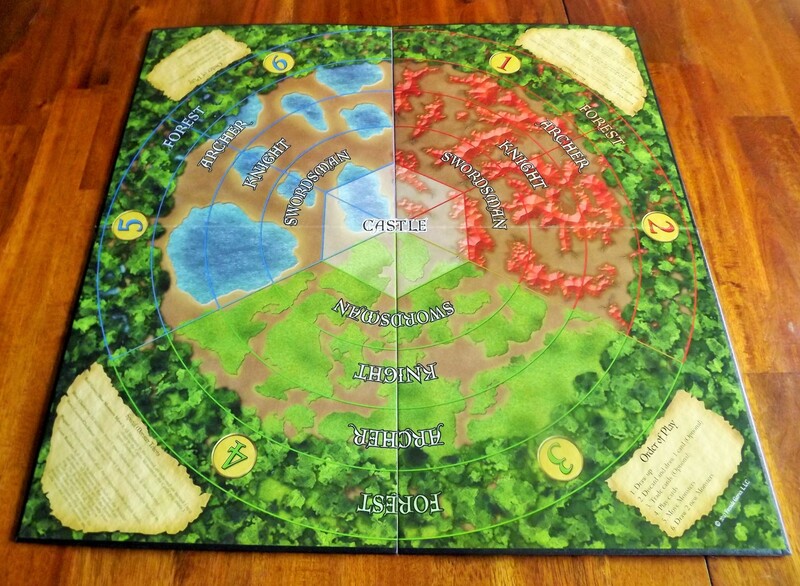 The game board is sturdy and durable as are all the cardboard pieces. The colours are bold and vibrant and the layout easy to understand. The pieces have fun, cartoon-like characters on them that can appeal to young and old gamers. It is not a beautiful game, but the materials feel like they will last. The cards on the other hand feel flimsy and thin. The low quality card stock means they don’t shuffle or stack easily. Sleeving them may help this out. The rule book is well thought out and puts forward the rules in a simple and easy to understand manner. I had no issues learning or teaching this game and it can be done in about 5 or 10 minutes. Since it’s co-operative, you can also teach it as you play. This does mean it can be prone to “Alpha gamer” problems (one gamer taking over, telling others what to do and running the board) but with the right people playing, you should be fine. One thing I noticed was, there are no female characters. Even a female monster would be nice! The characters depicted on the cards are the same for each colour so perhaps it cost more for the artist to create female equivalents. However, there are single cards and tokens that could have been made female. It certainly would have given some variety to the very standard artwork. These are who I have to rely on? This isn’t one of the deepest games, but its ease and accessibility are what makes it appealing. It’s a great filler to play between heavier games since it can be wrapped up in under an hour. I have had great success introducing people to other games through this one which is why I recommend it.